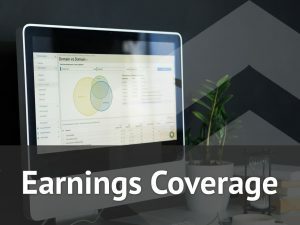 Tyson Foods (TSN) reported mixed results for the first quarter of 2019 in which earnings surpassed estimates, while revenue failed to meet the expectations. The meat manufacturer posted earnings of $1.58 per share on revenue of $10.19 billion. Analysts had expected Tyson Foods to earn $1.57 per share on sales of $10.37 billion. Shares of Tyson Foods dropped about 1% in the pre-market trading on Thursday. The flat year-over-year revenue reported for the recently ended quarter was hurt by the decline in beef, pork and prepared foods volume. On a GAAP basis, the company reported EPS of $1.50, down 66% from the prior-year quarter, which included a one-time tax benefit of $2.68 per share. Beef segment’s sales volume declined due to a reduction in live cattle processed. Pork sales volume decreased as a result of balancing the supply with customer demand during a period of margin compression. Prepared Foods sales volume decreased primarily from business divestitures. However, chicken sales volume increased in the quarter aided by incremental volume from business acquisitions. For fiscal 2019, Tyson Foods reaffirmed its adjusted EPS outlook of $5.75-6.10 and expects sales to grow to approximately $43 billion due to volume growth and mix. For fiscal 2019, USDA indicates domestic protein production (beef, pork, chicken and turkey) to increase about 3% from fiscal 2018 levels, while Tyson Foods expect domestic availability of protein to increase about 2% as export markets should absorb a portion of the increase in production. 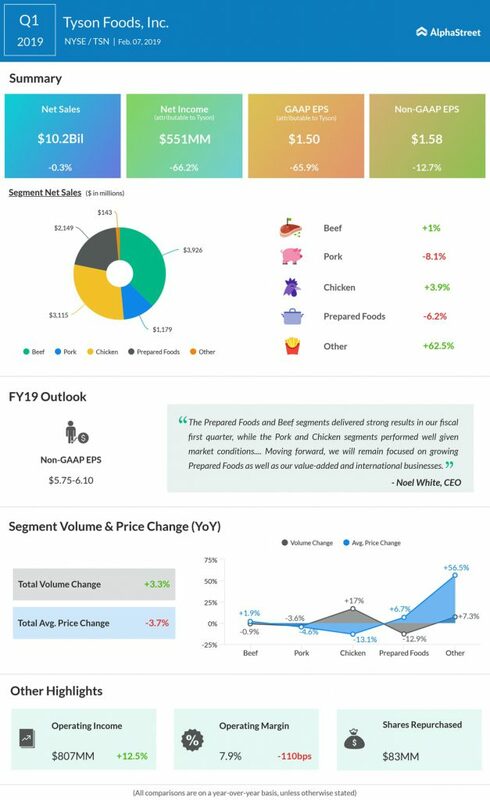 “The Prepared Foods and Beef segments delivered strong results in our fiscal first quarter, while the Pork and Chicken segments performed well given market conditions,” said CEO Noel White. Today, Tyson’s rival Yum! Brands (YUM) reported weaker-than-expected Q4 results and its shares were trading in the red before the bell. Yesterday, shares of another rival Chipotle Mexican Grill (CMG) rose over 7% after reporting better-than-expected quarterly results. Tyson Foods stock had dropped 2% in the last three months and gained 14% so far in this year.